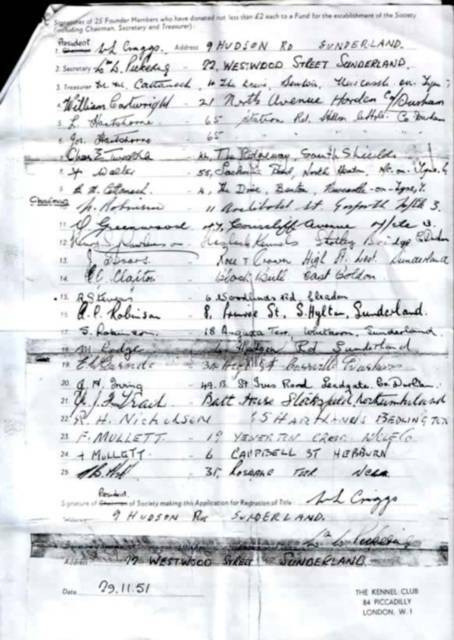 There was a real need in the North East for a local breed club, given that two nearest clubs were the Northern and Scottish Boxer clubs respectively. Whenever someone was spotted with a boxer, the owners were accosted and encouraged to go to training classes and/or show at open shows in order to get support for boxer classes at shows and also for the breed club. It was from here that the creation of the club was spearheaded. The club was formed early in 1952 getting a Kennel Club ‘rubber stamp’ on the 28th December 1951 and an official registered date of 19th February 1952 at a cost of one shilling. The concept of the first choice was to display the complete area that the club would serve. The clubs first president was Bill Craggs from Sunderland who held the Quantreau affix, with Norman Robinson (Gosforth), the first chairman, Mr Pickering (Sunderland), the first secretary and Margaret Cattanach (Benton) the first treasurer, and whose Steynmere boxers still enjoy success today through her son Dr Bruce Cattanach who was also a founder member. As the club developed, so did its activities with training classes held at Newcastle, Darlington and Willington in Co. Durham. At this time the club started to put on its own shows, with two open and one limited show each year, along with frequent rally and match nights. The clubs first show was held in Newcastle at a venue close to the Tyne Bridge, the date and precise location is unknown although another popular venue for some of these early events was the vicarage in Chester-le-Street. Judges for these early events were usually either ‘big name’ breeders or all-rounder’s with a special interest in boxers as in those days serious opinion was much sought after as the North East was so isolated. During this time of development and learning, some events of significance as recalled by Dr Cattanach were a visit by Phillip Dyson from the Northern Boxer Club to give a talk on the Boxer and which "Really opened our eyes to the history of the breed and how our boxers already differed substantially from the Americans, with continental types being almost what was left over from the war". 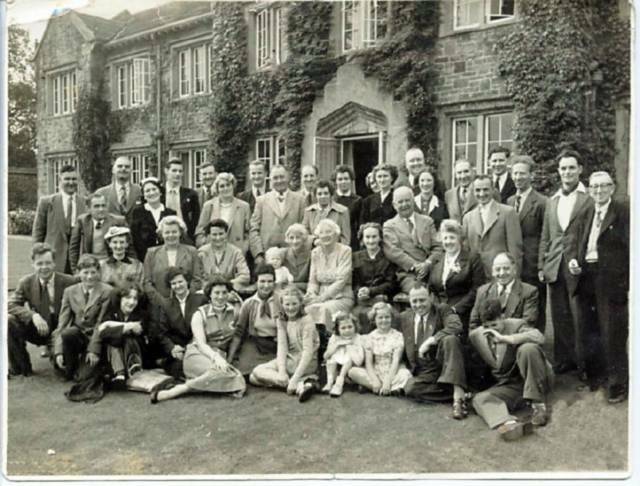 The other event remembered was a trip to Allon Dawson’s (Stainburndorf) mansion at Leathley Grange in Yorkshire where they saw the to-become-famous Frolich von Dom. It was almost 22 years later before the club was granted permission by The Kennel Club to hold its own championship shows, the first of which was held on the 23rd November 1974. Judge for this event was Vivi Wilson and was held at The Pavillion, Crimdon Park in Blackhall near Hartlepool. 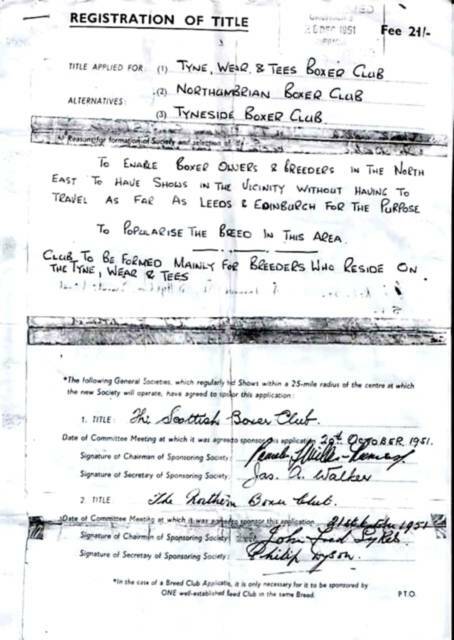 To bring the club up to date we, at the Tyne, Wear and Tees Boxer Club still try to maintain the ideals which were realised with the clubs formation over 50 years ago. The committee, although somewhat smaller than the original continue to serve and promote the North East region, holding championship, open and limited shows yearly, training classes held fortnightly, and also educational seminars.